It's June so just say alla griglia (on the grill) and you will be all set for summer cooking outdoors. Italians love grilled foods and, in particular, in the region of Umbria where alla griglia is a way of life. Everything from beloved porchetta (whole roasted pork) to an alphabet of vegetables is cooked on the grill to bring out natural flavors. Get a good grill. It will make all the difference when it comes to getting the most out of your food. There are many types out there, from gas to charcoal. 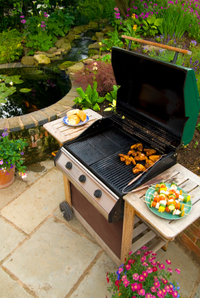 Where you live will be an important factor in determining what grill you buy. Don't be afraid of the heat. The biggest mistake people make is not getting the grill hot enough. Preheating the grill is essential and that may mean anywhere from 10 to 20 minutes. Be sure your grill has a thermometer so you know when to slap those ribs on without them sticking to the grill top! A hot grill is a stick-free grill! Cast iron is your friend. One of the best ways to cook on the grill is to use a cast iron pan for delicate foods like halibut, or scallops. Just put the pan on the grill while it is preheating and get it to 500F. Then add the delicate foods. It will cook in a flash and not stick. Don't be afraid to get saucy. Have your favorite sauce handy and dinner is ready in minutes, and the best part is, in the summer, you won't overheat the house! Follow directions. Cook over direct or indirect heat according to your grill manufacturer's instructions. Summer should be about slowing down and getting outdoors. That's why alla griglia should be your mode of cooking until the next cold wind blows! Let me know if you try any of these recipes and tell me how they turned out! Great article! I can't agree more about using cast iron on your grill. I have stir fried, baked and even cooked pancakes with mine.